The American Energy Alliance (AEA), a free market group with close ties to the Koch brothers, just released misleading results of a poll concerning the environmental virtues and federal support of electric vehicles, and voter opinions on auto efficiency standards. Though the poll showed that Americans overwhelmingly view electric cars as better for the environment, and a majority believe in the necessity and value of fuel economy standards, the AEA is claiming that Americans don’t support EV-friendly policies. Not surprisingly, most of the questions in this push poll were worded to influence the respondent’s choice, framing federal programs as anti-choice and taxpayer-supported. Let’s consider the messengers: both the group that commissioned the poll and the polling firm itself. Tom Pyle, president of AEA, has a long history of working with and for the Koch brothers and Koch Industries. As a lobbyist, he lobbied on behalf of Koch Industries and the National Petrochemical & Refiners Association (now the American Fuel & Petrochemical Manufacturers), in which Koch Industries is a core member and beneficiary. Today, Pyle serves as president of AEA and its sister organization, the Institute for Energy Research, which grew out of an organization founded by Charles Koch. The poll was conducted by MWR Strategies, which is a lobbying firm with clients including Koch Industries and the American Fuel & Petrochemical Manufacturers. MWR Strategies was founded by Mike McKenna, a longtime energy lobbyist who was forced out of Virginia politics during an ethics scandal of his creation. McKenna would later lead President Trump’s energy transition team before choosing to resign rather than de-register as a lobbyist. Coincidentally, McKenna was replaced as the head of the energy transition team by Pyle. 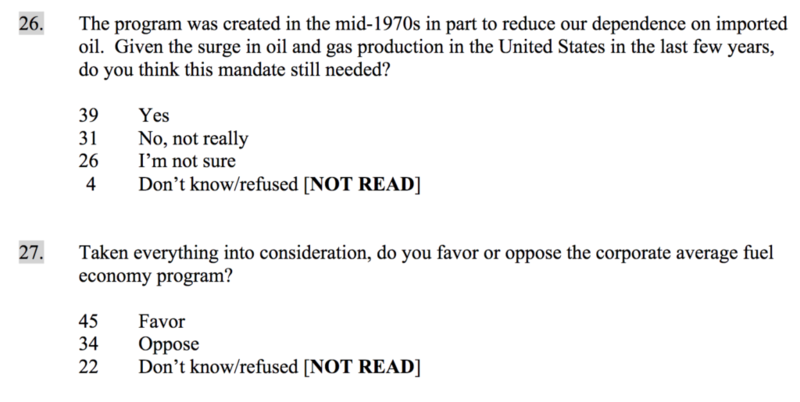 The actual questions, which can be seen here, aren’t provided in any of AEA’s publicizing of the poll results. 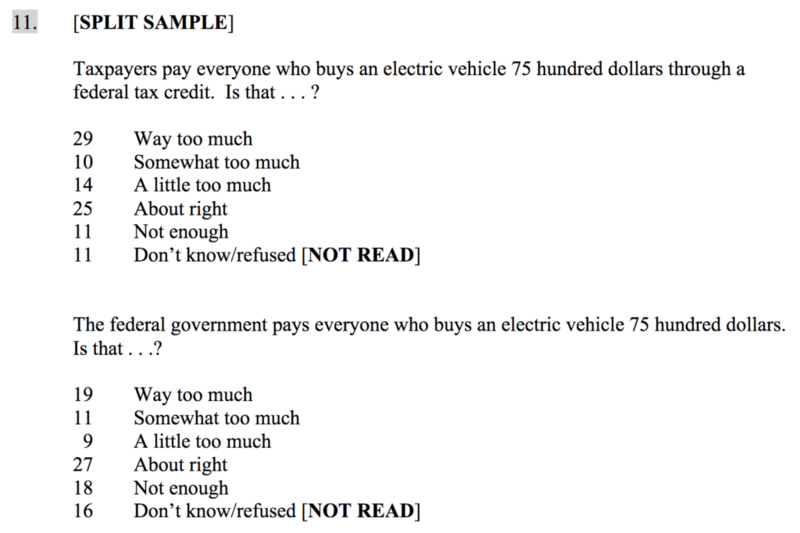 The questioner repeatedly manipulates respondents by implanting the idea that consumers are being forced to buy certain vehicles, and that they as taxpayers are being forced to pay for federal programs that support electric vehicle sales. Some questions even include demonstrably false data to sway responses. For instance, one question states that every purchases of an electric is is paid “75 hundred dollars” by the “taxpayer,” which is a gross misrepresentation of the non-refundable electric vehicle tax credit. In actuality, the tax credit simply lowers the buyer’s tax rate in the year of purchase—functionally the same way that a home mortgage interest deduction or child tax credit works. Another question claims, without evidence, that that the average income of an electric car buyer is $150,000, then asking whether the respondent thinks it’s “fair” that the buyer should “be paid 75 hundred dollars.” As of 2016, 54 percent of EV purchasers have a household income above $100,000. Additionally, most EVs are leased, and not purchased, and only 38 percent of EV lessees have a household income above $100,000. When the question was set up without a direct emotional connection to taxpayers, the results were much different. After hearing, “The federal government pays everyone who buys an electric vehicle 75 hundred dollars,” the percentage of respondents that said it was “about right” rose to 27 percent, the most of any category. Those who said it was “way too much” dropped to 19 percent. As it has promoted this poll, the AEA hasn’t highlighted the results of the questions about corporate average fuel economy (CAFE) standards. That’s probably because the public voiced overwhelming support for federal fuel economy standards, despite the persuasive anti-regulatory framing of the questions. All told, 45 percent of respondents favored the federal government’s CAFE standards program, and only 34 percent opposed it.